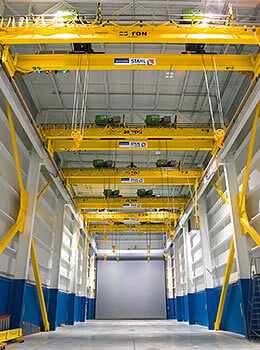 As a builder of high-quality hoists and crane components, STAHL CraneSystems is the favoured partner for systems builders and all builders of overhead cranes, bridge cranes and crane systems all over the world. We leave consulting, design and building of the crane systems and crane bridges to expert crane builders on the spot. The regionally orientated crane builders stand for proximity, reliable and personal consulting and comprehensive service. As a crane technology expert, STAHL CraneSystems offers its partners 140 years of experience and the engineering expertise of the leading supplier of explosion-protected hoists and customised solutions. We thus enable even small-sized crane building partners to build complex crane systems and overhead cranes beyond the standard market. For tricky installations and technical questions, the experienced staff of our customer service centre are at the disposal of the crane and systems builders on site. If you are looking for a bridge crane or a crane system, you will find the expert crane building partner in your vicinity here.